Prof Mary Okwakol, the Uganda National Examinations Board chairperson, speaks at a past event. File photo. Panic has gripped different schools across the country after the Uganda National Examination Board (UNEB) withheld results of 4,525 candidates who sat Uganda Certificate of Education (UCE) examinations last year. 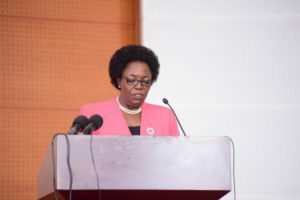 Prof. Mary Okwakol, the UNEB chairperson, while releasing the results yesterday, said the board is withholding the results for 112 centres suspected to have been involved in various examination malpractices. “A total of 81 people suspected to have been involved in examinations malpractices were arrested by police. 49 of them have already appeared in court,” she said. Among the schools whose results were cancelled include Kajjansi Progressive School, where results of more than 253 candidates have been withheld, Nyendo Mixed Secondary School, Nserester Senior Secondary School in Masaka Municipality and Nile High School in Luuka district. At Kajjansi Progressive School, the affected students and parents were seen flocking the headmaster’s office. “Cancelling my results has psychologically affected me. We have come here to seek a remedy with the school management,” said a student only identified as Kintu. However, the school proprietor Ms Rebecca Nsangi, in an interview with PML Daily assured parents that this was a temporary setback. “It is very unfortunate that we have been dragged into this. There were investigations carried out and our school was cleared. It is a surprise that our results have still been held. However, we shall get to the bottom of this and all students will get their results,” Ms Nsangi said. In Masaka Municipality, the managers of Nyendo Mixed Secondary School have not yet opened their offices after receiving information that UCE results for their students had been withheld by UNEB. Some parents reported at school in the morning today (Thursday) only to find offices locked with paddocks. For Nserester Senior Secondary School, its head teacher Madinah Bananuka denied involving in examination malpractice, saying that their results were withheld because of the outstanding debt the centre owes the board. “When we took over management of the school about two years ago, we inherited a huge debt which we have caused us problem. But we are working out modalities of clearing the debt,” she explained. Meanwhile, Bukwo and Butaleja districts topped the list of worst performed districts in 2017. An average of 28% of the candidates who sat for UCE exams in the two districts failed their UCE examination. Daniel Odongo, the Secretary of UNEB, said all the 10 worst districts with high failure rates were from the eastern region. Kampala and Wakiso districts were the best, with 7,000 students passing in division one followed by Kampala with 3,895. He noted that 3,121 boys (1.9%) did not turn up for the exams compared to girls at 2,972 (1.8%). But Odongo added that male candidates performed better than their female counterparts in all subjects except English where girls out performed boys.